CELTA Course Preparation: How to prepare for the CELTA course? Hello, Stephen. I’m currently preparing for you CELTA course and I am lost. I feel like I’m not organised in my preparation at all. If you have any tips on how to organise my preparation, that would be nice. Thank you. Amina. Okay, it’s certainly a common feeling not knowing where to start with [CELTA course] preparation because it can feel like there’s so much to do. However, the fact that you are preparing is already a great sign because some people, including myself, don’t do a lot of preparation for the CELTA course. 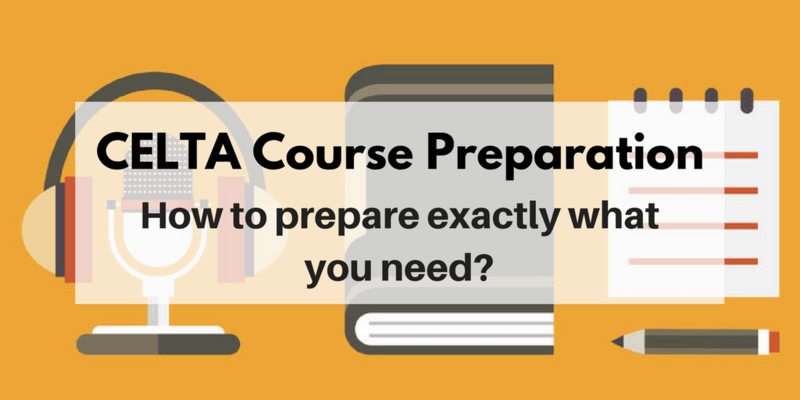 What to do next for your CELTA Course Preparation? Firstly, do background reading only around the parts of the course that you are concerned about and other things that worry you. For example, if the thought of explaining grammar to a group of students scares the living daylights out of you, focus on reading how to explain grammar and also the rules of grammar, particularly the verb tenses and other parts like that. Whatever it is, if something gives you that fear, then that’s definitely something that you should focus on because the preparation can help calm those nerves and give you that extra confidence when delivering the lessons on it. Now if something like just standing up and talking to a class in general doesn’t worry you, then you don’t need to worry too much about that. Personally, the things that worried me were not knowing the answer. So I didn’t really know how to prepare for that. If they asked me a difficult question, I wasn’t sure what to say. But I did get the answer to that on my CELTA course and I think I’ve mentioned that in another answer on this blog. Otherwise, I would mainly suggest reading about the practical or logistical aspects of the course, specifically the assignments, and you can see my article on the CELTA course assignments here with a link and also focus on lesson planning. There are also some lesson plans you can download as templates to have a look at and, as I’ve mentioned before, definitely have a go at trying to write a full lesson plan before you start the course. Now the lesson plans, that will give you a really good idea of how long it’s going to take you [to do] and how difficult it is and again, [highlight] more areas that you might need to work. If you’re focusing on the assignments…, therefore, you can find out lots of things like what is expected of each one, how you can do it, how they’re graded, and things you can do to prepare for them and you can do some reading for [the assignments]. There’s so much you can do to prepare for the assignments and I’ll go into more detail in other posts, but just do that. Focus on the things that worry you and focus on the things that are logistical and practical and have clear limits and boundaries (i.e. assignments and lesson plans) so you know exactly what you’re doing with them. As for the teaching, I wouldn’t worry too much about the teaching side as, in my opinion, that is best learnt while you were on the course because your tutors give you feedback and it’s all about developing as a teacher. So, if you’re teaching and they give you their honest and genuine feedback on the lesson because they will give a lot of detail in this, then you have to reflect and apply that. But really, for me, teaching is not something you can read much about because it’s all about doing and it’s about experience and learning as you go. So that’s how I would do it if I were to do it again and I hope that was clear and useful. Leave any comments or questions below and I’ll get back to you soon!